Probably the easiest drop-off technique, the side drop can be performed from any awkward position, even when caught off your guards. 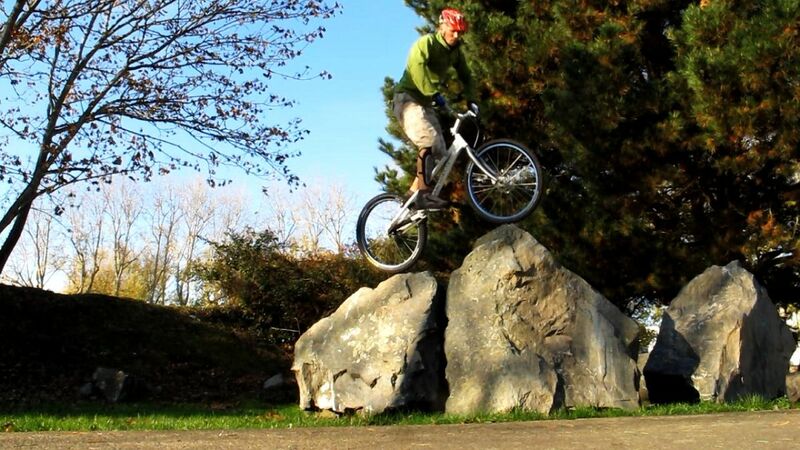 This is very usefully in natural bike trials when the wheels are not level, on uneven rocks. Aurélien Fontenoy ready to drop-off sideways. If you find yourself out of balance or in a tricky situation, you also can use your last correction hop as an emergency exit drop-off to the ground. This approach is basic but a very efficient way to leave a rough section, with dirt and roots or slippery rocks. 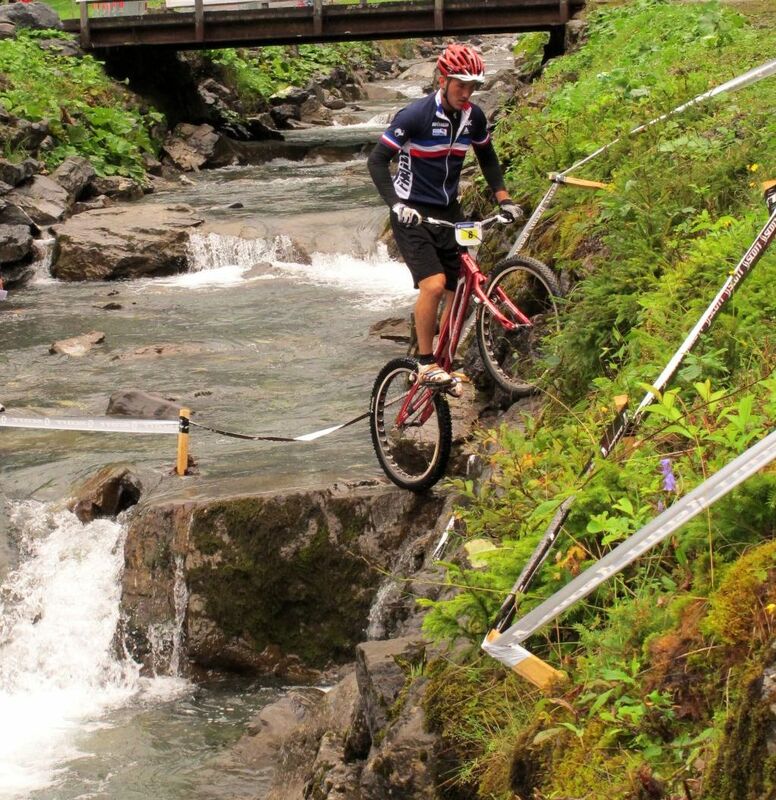 In such conditions, it may be too risky to perform a front wheel pivot or to maintain your balance on the back wheel. 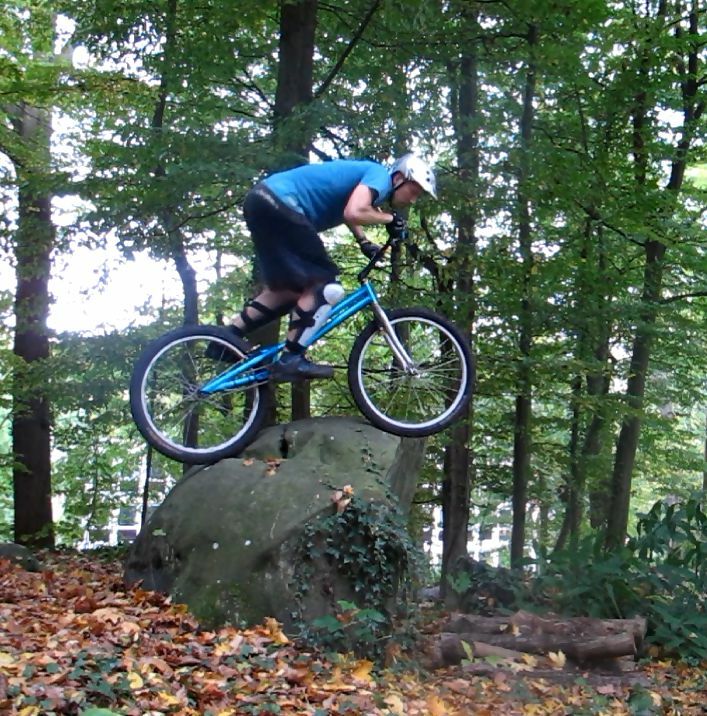 A quick hop is all what you need, with no pedal kick involved. 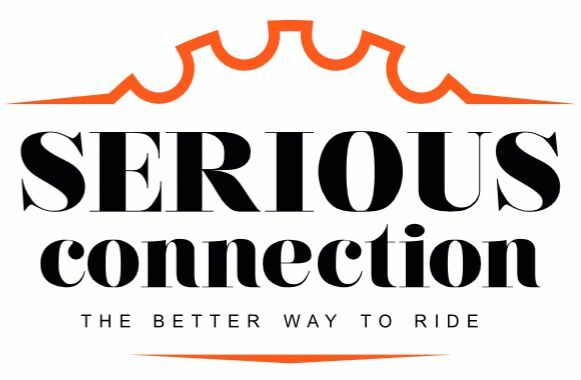 First you should know how to hop the full bike with you. Learn this on your favourite side, which is likely to be your front foot side. Flex to compress both tyres. Skew the impulse sideways over the gap. Get as close to the edge of the obstacle as you can, on the side you want to drop-off. Either ride along the edge, or get closer with a series of progressive hops to end up with your front foot nearly over the gap. With both brakes locked, flex just enough to compress both tyres and use the bouncing effect to your advantage. 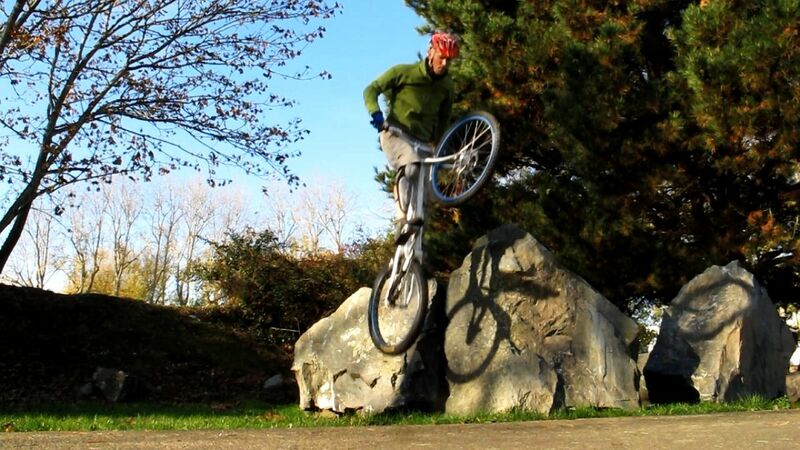 Skew the impulse sideways over the gap as you spring up firmly with both your legs and arms. Pull up the whole bike and take-off sideways, tuck until you have cleared both tyres off the edge. Only when both wheels are clear, let the rear wheel drop first by pulling the bars to your abdomen while stretching your legs down. Re-align the bike beneath you before you land. 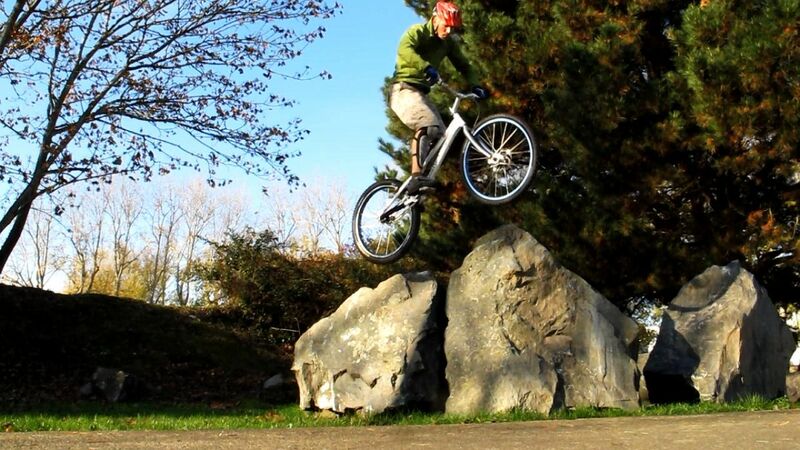 It is important to target your landing zone with precision and land aligned over the bike, otherwise you may be thrown off-balance upon impact with the ground. Keep your brakes locked as the rear wheel touches down and crouch progressively to absorb most of the impact on the rear tyre. 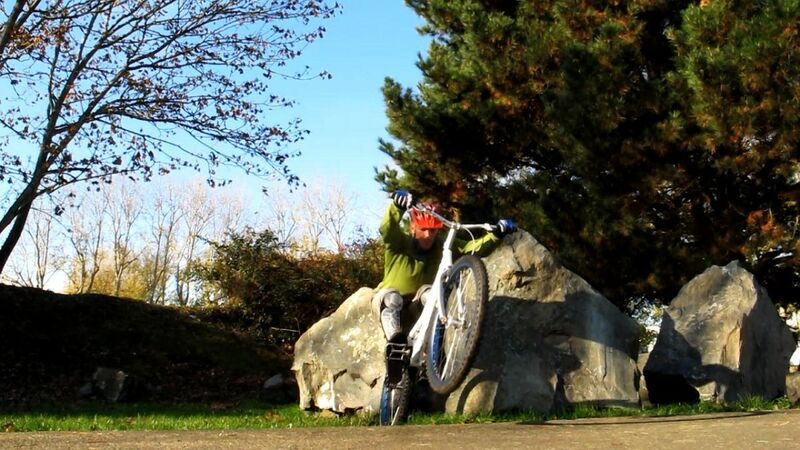 1° Get as close to the edge of the obstacle as you can, on the side you want to drop-off. 2° With both brakes locked, flex just enough to compress both tyres and bounce back. 3° Skew the impulse sideways over the gap as you spring up firmly with both your legs and arms. 4° Pull up the whole bike and take-off sideways. Tuck until you have cleared both tyres off the edge. 5° Only when both wheels are clear, let the rear wheel drop first, pull the bars to your abdomen while stretching your legs down. 6° Re-align the bike beneath you before you land. Keep your brakes locked as the rear wheel touches down and crouch progressively. Let the rear wheel drop to reduce the jump height. Re-align the bike with your torso to land straight. Hang firmly to the handlebars to control how fast the front wheel drops. 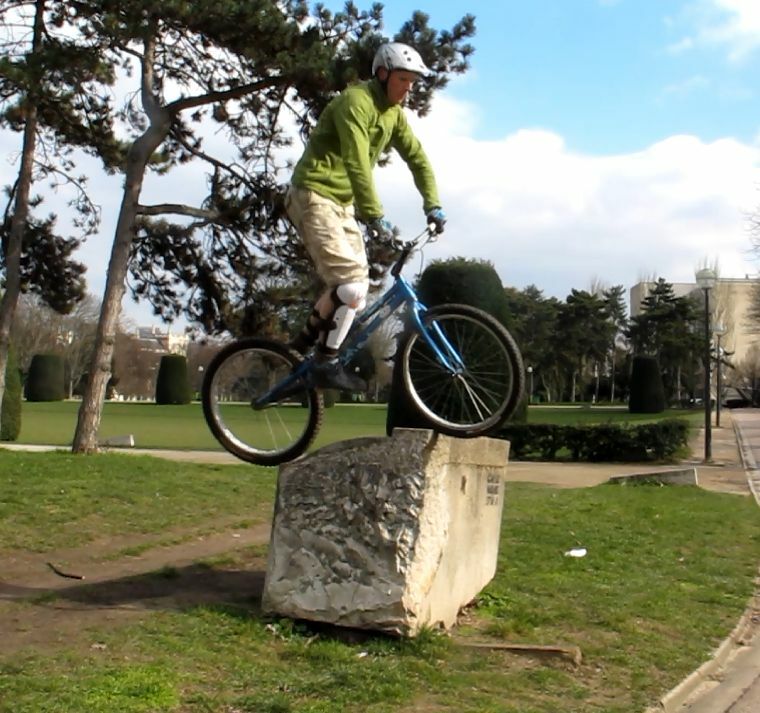 For a stable landing, slightly turn the bike in mid-air to land aligned with the general direction of the move. This will prevent you from being thrown off-balance upon impact with the ground. 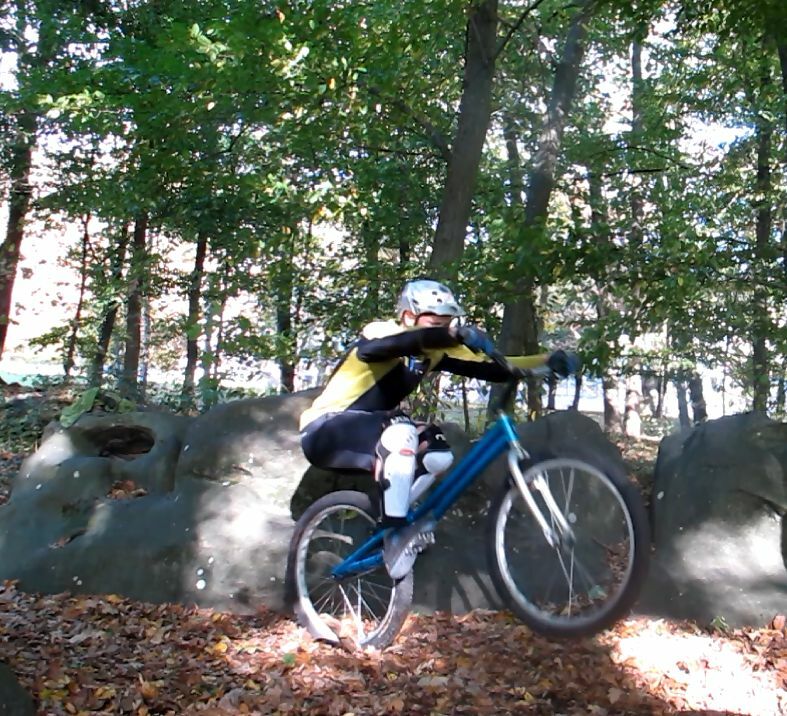 Use the momentum of your shoulders to swing the bike in a change of direction. With a little bit of practise, you can easily turn 90 degrees or more to land as if you had been facing the gap standing on your rear wheel. Focus on landing your rear tyre onto a specific target, for optimum grip, or to secure some support for the front wheel.